This is the king of comfort food, and if you are a big fan of brocolli and stilton soup then you will naturally love this, it has those big bold flavours. However, it has plenty of texture too so if you fancy those flavours but more of a satisfying meal, then this is for you. It’s so easy to make and you can do it in one pot if you have one which transfers nicely from hob to oven. 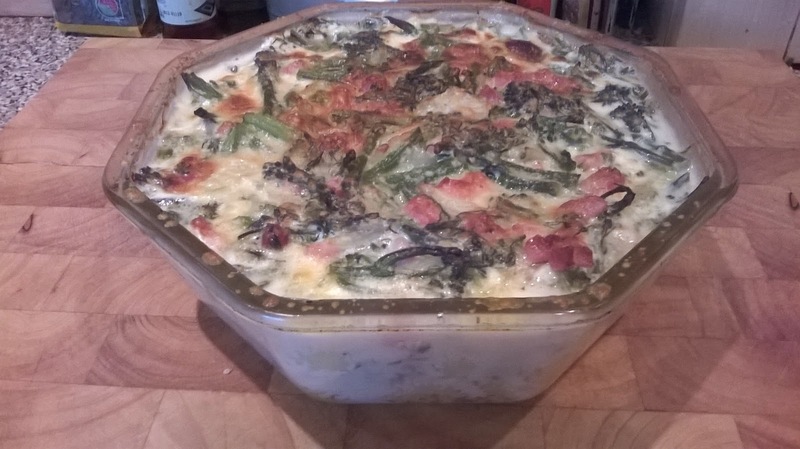 This will serve 5, can be made in 30 minutes and freezes/reheats the next day extremely well! You can easily make it veggie by leaving out the pancetta too. 1. Chop the onion and put in a large pan with the chopped pancetta. Cook on the hob on a medium heat until the pancetta has started to crisp. 2. Cut the broccoli into bitesize pieces. Add to your pan and cook for about 5 minutes. 3. Stir in the creme fraiche, water and thyme and bring to a simmer. 4. Put the uncooked gnocchi into a deep oven proof dish. Cut the stilton into 1cm squares and layer on top – spread it out as evenly as you can. 5. Pour over your broccoli and pancetta sauce, spread around with a wooden spoon until even. 6. Grate the parmesan over the top, then put into the oven at about 160 degrees for 20 minutes, or until bubbling, thickened and golden brown on top.